Chapters on the origin of the Templars, their popularity in Europe and their rivalry with the Knights of St. John, later to be known as the Knights of Malta. Detailed information on the activities of the Templars in the Holy Land, and the 1312 A.D. suppression of the Templars in France and other countries, which culminated in the execution of Jacques de Molay. Also information on the continuation of the Knights Templars in England and Scotland and the formation of the society of Knights Templar in London and the rebuilding of the Temple in 1816. Plus a lengthy intro about the lost Templar fleet and its connections to the ancient North American sea routes. This is our best selling book on the Templars -- it is the foundation book for Dan Brown's THE DA VINCI CODE. It is also about the Temple Church in central London that is featured in this book. Dan Brown testified at the copyright trial in London that the foreword to this book is what inspired him to write The Da Vinci Code, rather than Holy Blood, Holy Grail. 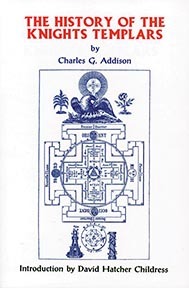 HISTORY OF THE KNIGHTS TEMPLARS by Charles Addison. Introduction by David Hatcher Childress. 395 pages. 6x9 Paperback. Illustrated, Bibliography, Index, Foreword.